Senate Democrats and 11 Senate Republicans voted on Tuesday to advance a measure which would prevent the Treasury Department from relaxing sanctions on Russian companies connected to Oleg Deripaska, an oligarch with ties to the Kremlin. House Minority Leader Chuck Schumer (D., N.Y.) proposed the resolution to oppose President Donald Trump's decision to lift sanctions on those firms, CNN reported. Schumer forced the vote under a provision of the 2017 Russia sanctions law, which allows lawmakers to reject any attempt by the Trump administration to loosen sanctions on Russian companies, within a 30-day window if they believe it undermines United States economic or national security interests. The Senate voted 57-42 for the resolution, and it will need 51 votes on the floor to pass with a simple majority. It will need 60 votes to bypass a filibuster effort, according to Fox News. Republicans who voted to keep the sanctions were Sens. John Kennedy (La. ), Susan Collins (Maine), Marco Rubio (Fla.), John Boozman (Ark. ), Tom Cotton (Ark. ), Steve Daines (Mont. ), Cory Gardner (Colo.), Josh Hawley (Mo. ), Ben Sasse (Neb. ), Martha McSally (Ariz.), and Jerry Moran (Kan.). House Majority Leader Steny Hoyer (D., Md.) introduced parallel legislation on Tuesday, which will give the Democratically controlled House the option to proceed ahead of Thursday's deadline for congressional review. The Treasury Department notified Congress in mid-December that it intended to lift sanctions on the companies linked to Deripask following the oligarch's holdings being reduced. The companies are Rusal, the world's second-largest aluminum producer, EN+ Group, and JSC EuroSibEnergo. 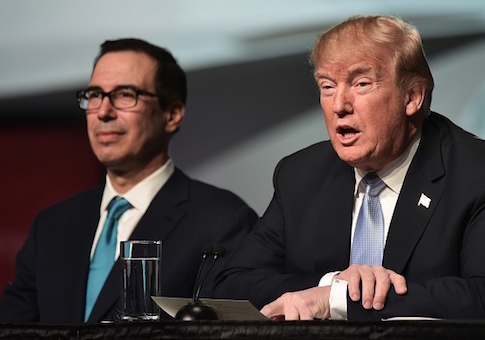 Treasury Secretary Steven Mnuchin met with Senate Republicans last week to convince them to support the Trump administration's desires to lift the sanctions. "We have been tougher on Russia with more sanctions than any other administration." Mnuchin said after the meeting. He also told reporters that sanctions "shouldn't be a political issue," Fox News reported. This entry was posted in Politics and tagged Chuck Schumer, Russia, Senate. Bookmark the permalink.